To build wealth and reach financial independence, you simply need to spend less than you earn. It is an easy concept to understand, but why is it so difficult? To answer this question, you need to examine the roots of overspending. When you know what factors drive your spending, you can fight back and save money so that you can spend less than you earn. For most people, this is the biggest reason for overspending. Just take a look in your mailbox and you’ll quickly see why. People are flooded with credit card, mortgage, auto loan, and refinancing offers on a daily basis. Oftentimes, simply filling out the short form or jumping on their website will be all it takes to obtain a new line of credit. It can almost feel like free money. They send you a card with a $2,000 limit, so it is easy to think that you now have access to more money. While you do have access to this additional credit, the real problems start when you’re charging things that you don’t have the cash to pay for. It is all too easy to think about the small monthly payments instead of the total purchase price. 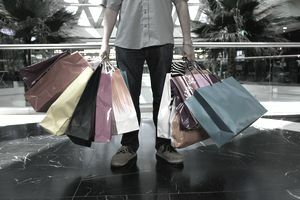 When you had to rely on keeping enough cash on hand or carefully balance your checkbook each day, the act of spending money meant you had to do a little planning and some simple math. Now, all you have to do is swipe your debit card like you would a credit card and the funds are electronically whisked out of your account. When you aren’t physically handing someone money or a check for a purchase, it can almost feel as if you aren’t spending money at all. Try using cash to get your spending under control. Credit cards can be a great tool when used properly. In the early days, these cards typically required that you paid the balance in full each month. This came in handy as you could make purchases without using your own cash and then repay it all at the end of the month. Effectively, this is an interest-free short-term loan. When used as intended, this can be a powerful financial tool. The problem is when you begin to let the balance carry over from month to month. If you make a $200 purchase on your credit card and find out that at the end of the month you can’t afford to repay the full amount, you’ve started down a slippery slope. It may start with good intentions while you promise yourself that you’ll have enough next month, but more often than not, that doesn’t happen. This is when the high-interest rates on the cards really begin to hurt you. The card company makes the minimum payment due a very small amount, which means that you can afford to make the payment, but if you continue to just pay the minimum, you’ll end up spending the next 20 years paying off that original purchase and spend more on interest than the cost of the original item. That is no way to build wealth. Have you ever had a friend or co-worker come up to you and suggest a fun activity? Everyone loves going out and having a good time, but you have to make sure that it is in your best financial interest. We all need to enjoy life, but it is important to know when to decline. It can be easy to simply go out to eat or to the movies and just pay for the evening with your credit card, which if you don’t pay off in full each month means you’ll be paying for that evening for a long time. Don’t squander your financial future for a few guilty pleasures today if it isn’t in your budget. If you know that you can’t afford an activity, don’t cave in. Instead, invite your friends over for a dinner party, game night, or some other activity where you can still enjoy time together, but without breaking your budget. Let’s face it—buying yourself something feels good. Whether it is a new pair of shoes, the hottest new video game, or even a good book—we all enjoy getting something new. There is absolutely nothing wrong with this, as long as you don’t go overboard. This is where it can pay to set aside a little “fun money” in your budget. Take a few dollars out of each paycheck and tuck it away for times like these. You’ll feel good about your purchase whether you make it with cash or by credit card, but you’ll feel even better when you don’t have to spend the next two years trying to pay it off with 20% interest.